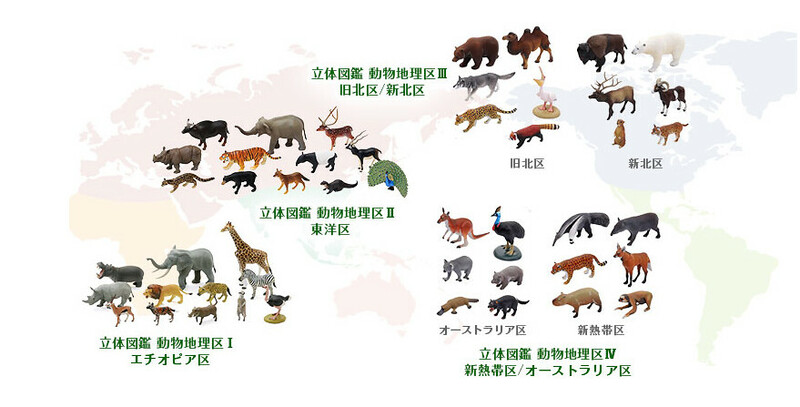 The first Zoogeographic Regions box is now available. They started with the Ethiopian region (subSaharan Africa, to a first approximation). Three others planned: Holarctic, Neotropical (oddly combining the Americas with Australia), and tropical Asia. So it probably won't happen. Colorata is too expensive to just get a small handful of figures! That Pelican is a must-have. The other birds are nice but I won't be hunting them down on their own unless someone is explicitly interested in splitting costs on these sets. It's nice to see another Japanese company taking a broader geographic approach (akin to the recent Kaiyodo Wild Rush sets), even though there is nothing specifically for me. I would have liked more variation within the individual sets, like the ones they started(?) for regions of Japan. Only one bird in each set for any major diversity, no reptiles fish or inverts to be found. It's kind of sad really given Colorata is typically quite good about making sets that don't feel derivative and include interesting choices. These just feel like higher end versions of every generic dollar store "wild animals" set. These just feel like higher end versions of every generic dollar store "wild animals" set. Some of the diversity is at least unique, or less common. But I never noticed that, yes, they kind of smack of 'sell out' sets that are very generic and populist. Not so bad from a commercial point of view, but we know Colorata can do better.